Yet there is no character in any TV show or film or sitcom who owes nothing to, or has improved upon, this parade of human quality, vanity, sin, crime, self-delusion: you can save watching a year's television by reading the 'Prologue' in an evening. It contains and expands the rumours, and humours, of all life in 858 lines. I hardly exaggerate - David Hughes on Chaucer's The Canterbury Tales. 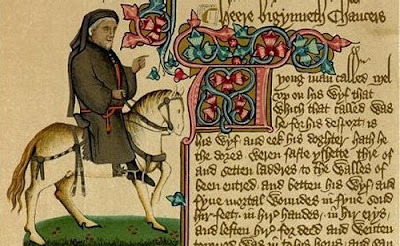 The poetry of Chaucer was influenced by the French poet and composer Guillaume de Machaut (c. 1300-1377.) 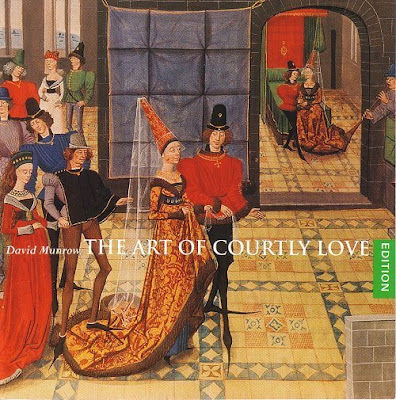 David Munrow's classic 1973 album The Art of Courtly Love (booklet art below) is the perfect introduction to Machaut and his age. Tarik O'Regan's 2006 choral work Scattered Rhymnes is inspired by Machaut's music and is on a CD that also contains the French composer's Messe de Nostre Dame and Douce dame jolie. Read about David Munrow here and here, and listen to his recording producer Christopher Bishop in conversation with me in this podcast. Tarik O'Regan's take on Machaut featured in my post Mixing it.